The Ogcocephalidae - commonly called the batfishes - are certainly a weird bunch. This group of fish is made up of some truly ugly and bizarre looking creatures - so much so that I couldn't pick just one! 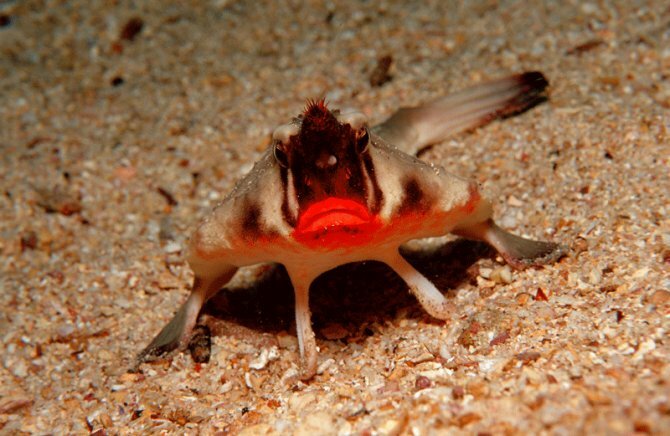 The batfish, (not to be confused with the rather more attractive Ephippidae batfish) are related to the anglerfish, and share some similar characteristics, but taken to new extremes. These are odd, lumpen and misshapen looking creatures, many of them looking rather like a rusty frying pan discarded at sea by a careless cook, when seen from above. The scientific name Ogcocephalus comes from the Greek for 'swollen head' and their bizarrely shaped body is largely made up by a huge, bony head either side of which are what appear to be a pair of arms. The rest of the fish rapidly tapers away into a short, stumpy body and tail. These 'arms' are in fact a highly developed pair of pectoral fins with which the fish strides along the sea bed in search of a meal. The fishes' pelvic fins are also developed for this purpose but to a lesser extent. They are reluctant swimmers but by paddling these 'arms' and flapping their short tails they can put on a surprising turn of speed when necessary. Many species have strange horn-like projections on the tip of their noses, the exact purpose of which is unclear. They feed by stalking along the seabed and settling in a likely spot, usually frequented by typical prey such a crustaceans and smaller fish. Once settled, they deploy a small lure hidden in an opening above their eyes. Unlike many anglerfish this lure is not bioluminescent but it does secrete an unknown fluid which some scientists speculate may be a chemical inducement to prey. By twitching this lure they attract their prey near enough to snap up in a sudden lunge forward. Most species are covered in bumpy, pyramid-shaped tubercles giving the fish an armoured look and this bony surface is itself often colonised by algae and other marine life offering many of these fish excellent camouflage. Several species have enlarged, comically red lips surrounded by hair-like structures giving a first impression of a startled, unshaven cross-dresser caught in the act of trying on his wife's lipstick! They are distributed worldwide in tropical and subtropical seas with 'Old world' species being typically deep water dwelling at depths between 200 and 3000m/650-9750ft, while 'New world' species live in shallower coastal waters. The largest species grow to around 40cm/16" while the smallest are just a few centimetres long.